High efficiency & optimum use of space. A portable model gives multi use effect. It can be used for unloading purpose also. Can be load or unload at height. Various models available as per customers need. Belts MOC & design shall be selected according to conveying product specifications. Chain MOC will be in MS, SS ETC. A wide range of sieves available in sizes from 4 mesh to 500 mesh. It will save labor cost effectively. 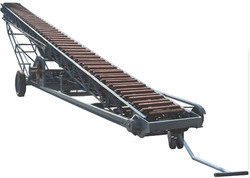 We are one of the leading manufacturers & exporters of Truck Loading Conveyor. The portable model gives multi-use effect. Chain MOC will be in MS, SS ETC..